The human skull consists of many individual bones that gradually grow together as the development proceeds. 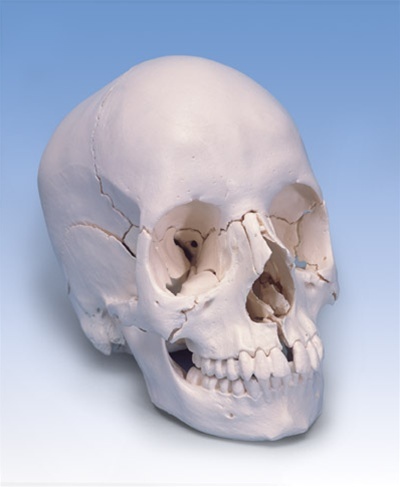 The best selling 3B Scientific® Beauchene Adult Human Skull is a natural cast and makes the complex structure of the skull easy to understand, since it can be disassembled into its 22 individual bones. The individual bones can be reassembled by means of inconspicuous, stable connectors attached at the slightly simplified skull sutures. All 22 bones are depicted in their natural bone color in this "Exploded Human Skull". We purchased this model for the specific purpose of demonstrating the interconnectedness of the skull bones, especially those inside the face, and showing how an alteration of any one of these bones, such as through accident, will also alter the other bones of the skull through association. This product has done a remarkably good job in meeting the technical challenges of creating a model that can be taken apart and put back together without sacrificing the accuracy of the forms of the bones themselves. The individual parts of the skull, the individual bones, can be studied closely, as well as the skull as a whole unit. The product might be said to have an (unavoidable?) weakness: when removing just one bone, or set of bones, (for the purposes of demonstrating a particular construction of the skull) , the rest of the skull does not hold together very well with these bones missing. But the fact is it does hold together if handled carefully, and we have been able to use it very successfully to study interactions and interrelationships of deep internal skull structures. We've been so pleased with the potential educational value of this kind of model that we plan to purchase further models to expand on our study of the structures of the entire head and neck. Everything is great. The only small problem is that the connectors between some sutures are a bit tight, but likely with continous use, they will loosen up. Other than that, fantastic quality skull!